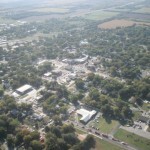 Lawrence Alley, the owner of Alley Field which is on the east side of Douglass, Kansas, had called for a Flyover of the annual Douglass Frontier Day. So, beings how most of us don’t have to be asked twice for an excuse to fly, I and a number of other guys showed up Saturday the 9th of October to participate. I was first to show up at the field and had opened the hangar’s bi-fold doors. Here we see the light from the “just risen sun” streaming into the hangar. Although I have a phobia about allowing my shadow to appear in my movies and stills, I thought in this example it would be neat to show how long the shadows are to especially indicate the time of day. Paul Fiebich, the Airbike Ace, arrived about 15 minutes after I opened the hangar and began pre-flighting his airplane. Since I was really impressed with my “long shadow” idea, I decided to do another one. This one also includes my MXL which has been pre-flighted and is ready for takeoff. Since this is October I have learned from experience you cannot count on the temperature. So, had put on long johns and brought my pullover AND jacket, gator and warm gloves. I really don’t like to be committed to a flight only to find myself in the air shivering. Sure enough it was a little nippy on the ground probably about 60 degrees. The interesting weather phenomenon of the day, though, was the temperature inversion that occurred in the transition from about 400′ to 1,000′. At 1,000′ AGL the temperature was about 78 degrees and the wind was from 25 to 35 mph almost directly from the south. Since Alley Field is almost directly east of Selby Aerodrome I settled into about a 45 degree crab for the flight. I took off first because Paul was going to wait for Chris Duncan in concert with their plan to take off about 8:30 am. It was actually kind of hot at my cruise altitude but, for me, hot is better than cold. I was the first guy to show up. Lawrence and his son were getting things ready for the squadron’s arrival. Finally Paul and Chris approached from the west in loose formation and broke off to enter the pattern. Paul came in from the north and fired up his smoke system. It looked good. My goal this morning was to get pictures of all the planes and hopefully the pilots in front of their respective aircraft. Lawrence’s son Terry showed up a little bit later from his hangar. Terry had installed a Hirth on his Kitfox a month or so ago and reports it is working fine. Above we see Larry Hart on touchdown landing his RANS Coyote. Larry is one of the more active sport flyers in the area. I see him and his wife at most of these functions. I bought my MXL from him about 3 years ago. Then it was red. I have done a lot of modifications to it in the last two years. Larry did a great job putting his Coyote together. Today he was flying solo. It is unusual to see him flying without his wife. One thing that impresses me about this airplane is how quiet it is. It seems to be pretty efficient also. Jim Wiebe showed up in one of his Belite airplanes. Jim has been marketing this ultralight for about a year now and seems to be doing well. His business is located at Wichita Airpark. The Belite incorporates carbon fiber technology for lightness and strength. Wiebe also offers a line of super-light, electronic aircraft instruments. Chuck Powell, famous for his countless parachute jumps around this area at football games and such, showed up in his Classic T-Craft. There was a lot going on this morning so I didn’t have much quality time to look it over. Next time I will. After a short organizational meeting (which I completely forgot to take a picture of) guys got ready to take to the air. The plan was for Lawrence and some of the faster planes to take off and rendezvous with some bi-planes at Pilot Pointe about 5 miles south of Alley Field. They would circle as the rest of us approached and then they would break off for the flyover with us in trail. I shot this from my “cockpit” in my position at the furthest north tie down of the field. Even though it is shot into the sun I think this is a cool picture of Lawrence Alley taking off in his Piper with the trademark water tower in the background. It was my turn to enter the active so I snapped this one off to give a sense of the action. Lawrence, Paul and Terry are seen heading south. The other guys are idling to cue up. After going pretty much according to plan we made three circuits of the parade. I snapped a few shots to show the action but have only included one here. If you look real close you can see people on horseback in a field in the lower right of the picture. The main parade is near the biggest cross streets at the center of the shot. I had heard at the gathering over at Alley’s Field that Chuck Gantzer was erecting his new building at Butler County Airpark. For a year or two he has been prepping the property by putting in electricity, pipes, a well and foundation. Chuck is an avid flyer and owner of a Pietenpol. He has an extensive under-floor hot water heating system which will employ solar heat. He also has significant insulation under the building and eventually throughout the entire structure. Chuck also told me he will have some active solar electricity generation using solar cells. I didn’t want to interrupt too much of their progress so I didn’t ask a lot of questions and cannot tell you when it will be done. I suspect he will be moved in by the end of October, though. I wasn’t liking the high angle of the first few aerials so I circled the pattern again at 300′ AGL and shot this last one. I think it shows the structure the best. When he is done Chuck will have a combined house and hangar that will be energy efficient and extremely strong. I left the pattern and headed back toward my home field. On the way back I saw something interesting (to me anyway…) and snapped this off. My little pocket cam doesn’t do it justice but it is a large pen area with no grass holding a number of horses and cattle all together. Usually you don’t see that. Normally horses and cattle are kept on grass. This picture is not all that great but I include it to give shape to what I will tell you next. As I continued toward my destination I saw these guys below with their combines. It was about noon and you can see they had just finished harvesting a large section of milo. A scene like this is always an excuse for Brian to put on a little exhibition. I continued heading west until I crossed the road you see going left to right in the shot. I was at about 1,000′ AGL. I then commenced one of my favorite methods to lose altitude – a tight spiral. After about 6 turns I emerged from the maneuver heading east at about 30′ off the surface. I then made a gentle turn to a path parallel to the rows you see in the field and just outside the right edge of the photo. Finally I turned south into the wind and passed to the east of the lunch crowd. I did a maximum pull up to about 200′. The guys all waved. Show over, I headed west again. I finish this report by showing you the Round House Barn just south of Derby, Kansas. I believe this is an antique dairy barn. It has been turned into a house. It is something I see all the time when heading east out of Selby Aerodrome but I haven’t featured it on the Flight Blog before. So, check it out!